Right now at Fine Line Home Builders our featured lots in the Okotoks area are ideal for creating an energy-efficient dream home customized to your exact specifications and that fits your needs and lifestyle perfectly. There is plenty of room in Alberta, and if you’ve always dreamed of owning your own custom home on a generously sized and private piece of picturesque land, now is an excellent time to make it happen. The Okotoks area has been inhabited by human beings for thousands of years, and its name is derived from a Blackfoot word meaning “rock.” The Blackfoot and other First Nations people in the area used a unique and very large rock found nearby as a navigational landmark for centuries. The Blackfoot “legend of the big rock” has been passed down for generations, and the tale is still told today. The Big Rock itself was registered as a Provincial Historic Site in 1978. The modern town of Okotoks was officially incorporated in 1904. Located 18 kilometers (11 miles) outside the Calgary city limits, Okotoks has a current population of approximately 25,000 people, making it the largest settlement in Alberta that is still designated as a “town.” It is largely a bedroom community of commuters who work in Calgary, and is home to a robust and growing number of enterprising small businesses, entertainment and recreational opportunities and excellent amenities. Privacy. Living on an acreage is ideal for people who prefer to maintain their privacy. You simply can’t get the kind of privacy you’ll enjoy on an acreage living in the city — out here, your neighbours are much further away, and homes are set back much further from the road. Space. On an acreage, you’ll have lots of space — space for your family to grow, space where you can raise your own crops, space for all your hobbies and workshops. Cleaner air. Compared to the city, air quality in and around Okotoks and the town’s outlying areas is extremely high. Not only will you enjoy breathing in cleaner air for its own sake, you’ll also be lowering your risk for a wide range of potentially serious diseases and chronic health conditions. Low crime rates. Crime is practically nonexistent in Okotoks, and even rarer in rural Alberta. If you place a high value of safety for your family, living on an acreage is one of the wisest things you can do from a statistical standpoint. Harmony with nature. 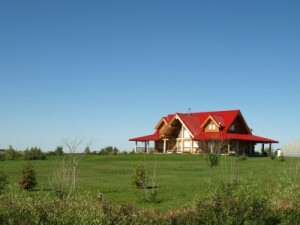 If you enjoy the outdoors, then living on an acreage is definitely the right fit for you. However, this may be more than simply a matter of preference; a number of scientific studies have linked better physical and mental health with people who enjoy the outdoors. Is there a paved road leading to your property? Travelling up and down a gravel road several times a day as you commute will take a toll on your vehicle, and can be difficult to traverse in the winter. What kinds of on-property developments are allowed, and what kinds aren’t? If you want to build a barn and stables, for example, you may face certain restrictions or require special clearance from municipal authorities. What is your water source? If it’s well water, how high is its quality and what safety measures are in place? How do local waste services operate? Consider the septic system as well as trash collection. Properly maintaining an acreage property requires a great deal of work and care. If you’re not up to doing it yourself, what local services are available to help you and how much do they cost? Fine Line Homes is a leading builder of green homes in Okotoks, Calgary, and throughout southern Alberta. If you would like to learn more about acreage living, or if you have any questions about our home design and building process, please don’t hesitate to contact us. We’re here to help make your lifestyle dreams an affordable reality, and we’re happy to answer any and all questions you may have about our custom homes.